A ‘work in progress’ family history website starting from an Archer family of South Oxford, who were freemen, brewers, haulage contractors, and first ‘Archer & Co’ then ‘Archer Cowley & Co’ furniture removers in the 19th and 20th Centuries, inter alia, to whom are linked by marriage the Penfolds and Wells of Southwark and Surrey, the Reeds of Devon, the Gilders of Oxford and Hinckley, the Morgans of Petworth, Sussex, the Garners of Middleton, Lancs and many others. There are connections via Phil and the present generation (born 1930s/40s) with a patent law firm known as "UD&L" with motor-racing and Scottish antecedents. c) So need to find some formal papers: birth/ marriage/ death certificate(s); (22.10.2014): Yes, the data from dutch websites (e.g. see Bilthoven cemetery under “Dates” below)provided by Klaas Sijsling confirm the names Ernest Albert. Ernest Archer is buried at Bilthoven Den en Rust cemetery, of which the online record (click here to go to the record) which shows his dates as: Born: 02.03.1874; Died: 20.11.1953. The same record shows his daughter Johanna Cornelia Archer as: Born: 02.10.1901; Died: 07.09.1980. So, both lived to about 79 - he, to about 8 months more and she, to about one month less. Third (say pba’s manuscript notes) child of: Alfred George Archer and Olive Emma Archer (formerly Reed). See the cv of his younger brother William (to be found in the “Somerville House” section of this website) for much more family detail. He is not currently shown on the “General Family Tree” but he is the elder brother (by about 4 years) of William George Reed Archer (born 1878) who is shown and is identified by the big red arrow in the “Tree Link to Somerville” page of that section. (A dutch lady): Marie (per 1960s family tree notes). (12.4.05): The photo of the family group taken by E.C. Hall of 5, The Plain, St. Clements, is marked in pencil: “Ernie, Marie, Alfred, Johanna”. Holland most of his life…. (his working life). It appears that during his period at the Keizersveer Raamsdonksveer paper mill, he resided there. 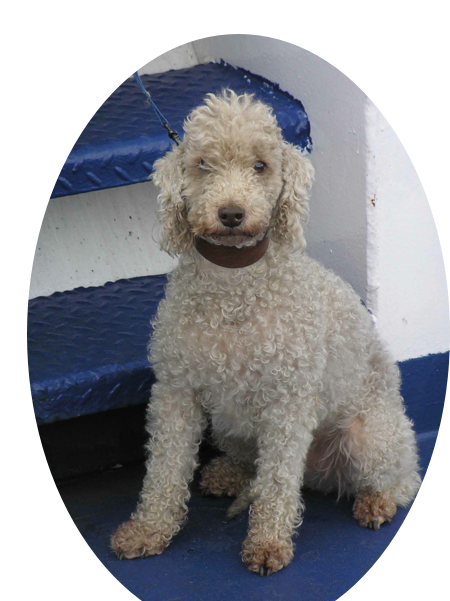 As indeed seems likley to have been the case with his younger brother, William. Subsequently he appears to have lived at Bilthoven, at No.13 Jan Steenlaan - an address which appears still to exist. Flew a biplane on Port Meadow in the 1920s; (11.5.2014: a monoplane, not a biplane - as can be clearly seen from the photographs. I suspect it is ‘a Bleriot’ in general design, as suggested by the ‘Flight’ article listing early aviators, which I have seen.(pba.ends). 29.5.16: Have not found and cannot recollect the origin of this ‘Port Meadow’ reference, which I therefore classify as possibly ‘family history apocrypha’. It seems somewhat unlikely in view of the (now) certain knowledge that Ernie’s flying in Holland came to an abrupt end with the crashing of the Dutch aviation group’s Blériot XI. However it is something to pursue when the opportunity arises. There is a question of why William Archer went home (from the Kaisersveer Papierfabriek) to Oxford in 1900 whereas his elder brother Ernest stayed in the Netherlands. An important factor here is the Boer War of 1899 - 1902 in South Africa, which led to strong anti-British feeling in the Netherlands. Another factor is that both brothers probably lacked any significant technical/scientific qualifications of relevance to the business of paper-manufacturing. Another factor is that Ernest had married a local Netherlands girl in 1898, whereas William hadn’t, and William went home to Oxford and married an Oxford girl in 1902. Also Ernest had found an alternative (to the paper mill) employment (selling Oxford-made motor cars) in NL, and I think William wasn’t interested in that. An interesting aspect of that latter factor is that William Archer’s eldest son Arthur (born 1903) was, like his uncle Ernest, intensely interested in Morris cars and wanted to (and did) join the Morris motor-car manufacturing firm, and worked for that group for a good many years (including driving an MG Sports car in the Monté Carlo Rally) before finally being persuaded to join his father in the AC&Co transport business. August 1908, Wilbur Wright demonstrates the ‘Wright Flyer’ at Hunaudieres near Le Mans, and in July 1909 sold the machine to ‘the US Army’, but in the years that followed became mired in patent litigation. Introduction: ­John Owen recalls the career of Ernest Archer, son of an Oxford Inland Revenue Officer, who built his own aeroplane half a century ago. He was Ernest Albert. Archer, son of Alfred George Archer, the Inland Revenue officer for the Oxford district, and just over half a century ago he made and flew his own aircraft. Educated at the old Oxford Wesleyan Day School in New Inn Hall Street, then presided over by the redoubtable Joseph Richardson, one of the outstanding schoolmasters of his generation, he left to join a paper manufacturing firm at Dartford in Kent This was controlled by his uncle, Albert Read, his mother's brother, and the member of a family well known in the paper world. Later on he was sent by his uncle to Holland to manage a Dutch paper pulp factory at Keizersveer on the river Maas, near Utrecht, and he was never to return to England, except as a visitor, for the rest of his long life. He was a most capable engineer, whose hobby was his work and he was devoted to anything mechanical. It was typical of him that when he saw his first motor-car while he was on honeymoon in Paris, he left his bride of a few days on the pavement while he ran after the vehicle to question the driver and examine the new machine. From that moment his interest in the internal combustion engine grew – before that it was steam and water power which had concerned him – and for the rest of his life he was intimately connected with the motor industry, primarily as the owner of one of the largest fleets of passenger carrying vehicles in Holland. Aeroplanes fascinated him too, and soon he was back in France at Pav, then one of the chief centres for the air-minded enthusiasts, where he learnt to fly. Just over a year after Bleriot had flown the Channel for the first time, he qualified and obtained his licence as a “pilote-aviateur” on August 9, 1910. It was the 214th licence to be issued by the Aero-Club de France. It was a wonderful machine (please click on the bold text) on the lines familiar to those interested in the aircraft of those days. Powered by a motor-cycle engine, it taxied on motor-cycle wheels, the springs of which were formed of catapult elastic. The fuselage was made of bamboo and strips of the same wood provided the ribs of the wings which were covered with cotton cloth – but it flew, an object of exciting interest to people who came long distances to Twello to watch the manoeuvres of the intrepid aeronaut. And my (pba’s) father Frederick George Blake Archer was unmistakeably named after Mr George Blake, furniture store proprietor and step-father to FGBA’s mother (Elizabeth Archer nee Gilder), and employer to WGRA for (I believe) probably most of the first two decades of the 20th century, until his Uncle James left his wealth and business interests to WGRA in or around 1925. His work in the A.E. Reed factories in Dartford and at Keizersveer near Utrecht (Raamsdonksveer?) in Holland led to him effectively never forming part of the ‘Archer clan’ in Oxford, as from (according to the Oxford Mail article) the time he left school, though Dad said he did visit (from Holland) quite often during his years as an importer of motor cars. And why, I wonder, did both of those two enterprising young men throw up the opportunity to be part of the growing Reed Group paper empire? I suppose we shall never know, unless it could be found in, for example, a biography of Albert Edwin Reed, whose obituaries I already have. Any of a thousand reasons, I suppose, including a wish for more independence than working in that organisation would have allowed. Both Ernest Archer and William Archer ended up working in their own businesses. [**] His book on the subject can be found at: (click here). Perhaps a better link is: (click here). which provides two pages of photographs from the book. The meaning of TE in "Archer TE" is not Thomas Ernest. The Dutch TE stands for the English AT or IN. So read Archer at Twello. Around April 1910 Ernest Albert Archer was appointed aviator of the Eerste Nederlandsche Vliegvereeniging (E.N.V. ), which in English roughly translates to First Dutch Flying Association. The E.N.V. then ordered a Blériot XI in France. In August 1910 the plane arrived at the Molenhei, a flying ground of the E.N.V. near Gilze-Rijen. 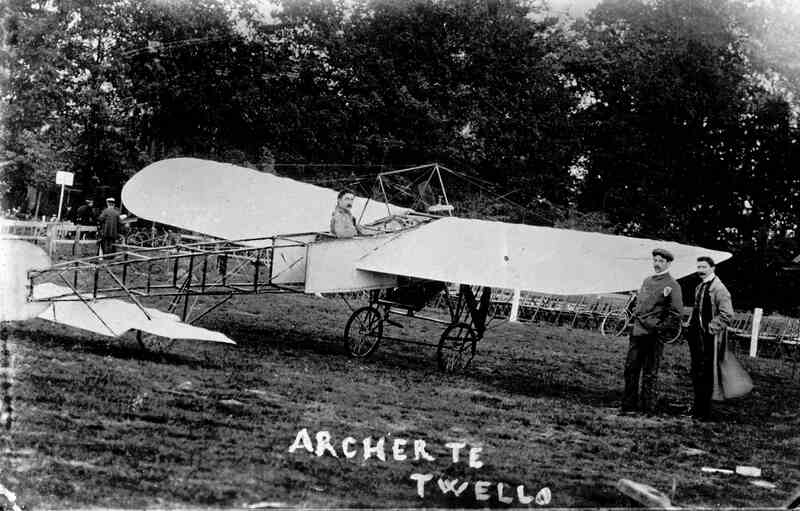 Archer, who in the previous month had successfully performed his flights for the flying certificate in France, flew this Blériot for the first time at the Molenhei on August 9. A gust of wind then resulted in a broken wing and propeller. Demonstrations at the Molenhei were announced for the period August 28 - September 4. Aviators: Archer and the Russian Ladislas Lewkowicz. The latter flew a Blériot XI as well. The wind allowed flying only on August 28, August 30 and September 1 (duration of the flights of Ernest mostly 1 - 3 minutes). On the last day of those three Archer and Lewkowicz flew at the same time. Until then the Dutch people had not seen two aeroplanes in the air at the same time. Subsequently demonstrations were announced in Twello (near Deventer) for the period 14 - 19 October. Aviator: Archer. The weather prohibited all flying on the first two days. On October 16th Archer made (two test flights and) two short flights (2½ and 1½ minutes) and on October 17th all went wrong: after a flight of 1 minute with a bad working propeller he installed another one and tried to fly again. Unfortunately the plane would not climb and Archer flew in the direction of a farm and a tree. It was not possible to fly between that tree and the farm; the plane hit the tree and pitched forward into a hedge. The Blériot incurred heavy damage, but Archer was unhurt. 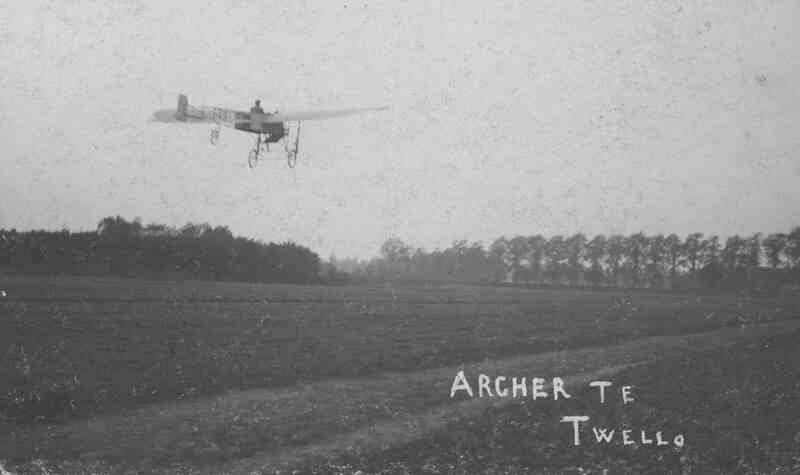 "Around April 1910 Archer was appointed as an aviator of the E.N.V. according to the newspaper Bredasche Courant. Undoubtedly this was conditional on obtaining his certificate in the future, as Archer did not have any flying experience at this time. When leaving for France he asked the reporter of Algemeen Handelsblad (a paper in Amsterdam) to report nothing about him as long as he (Archer) did not achieve anything (a proof of modesty according to the reporter). Archer used the planes of the Blériot school to learn flying (at Pau and Issy). In 1910 there was another Archer who built his own plane. He was called Walter Archer and lived in Salida (Colorado). Perhaps the reporter of the Oxford Mail mistook Ernest for Walter. The "Dutch" Archer did not build a plane in the Netherlands. The plane on both photographs is the Blériot XI of the E.N.V”. So, it seems clear that Ernest Archer definitely did not carry out the early aircraft manufacturing (and perhaps design) work which has previously been suggested. The aircraft he flew were clearly not his own, but those of the Blériot Schools at Pau and Issy, and of the Dutch Flying Association (“ENV”), and the latter was a Bleriot XI ordered by the E.N.V. from the Bleriot factory in France. Take a look at this link (click here) to find out about Bleriot XIs and compare these with Ernest Archer’s aircraft in his photos - it is very clear that Klaas Jan is right. As to whether Ernest Archer later ‘flew a biplane on Port Meadow’, is another question. He may have done so, using his French-acquired qualification and his experience acquired in both France and Holland. That claim requires investigation. Presumably permission from The Freemen of Oxford would have been required, so that is an avenue of investigation for me to pursue. "Louis Blériot established his first flying school at Etampes near Rouen in 1909. Another was started at Pau, where the climate made year-round flying more practical, in early 1910 and in September 1910 a third was established at Hendon Aerodrome near London. A considerable number of pilots were trained: by 1914 nearly 1,000 pilots had gained their Aero Club de France license at the Blériot schools, around half the total number of licences issued. Flight training was offered free to those who had bought a Blériot aircraft: for others it initially cost 2,000 francs, this being reduced to 800 francs in 1912. A gifted pupil favoured by good weather could gain his license in as little as eight days, although for some it took as long as six weeks. There were no dual control aircraft in these early days, training simply consisting of basic instruction on the use of the controls followed by solo taxying exercises, progressing to short straight-line flights and then to circuits. To gain a license a pilot had to make three circular flights of more than 5 km (3 mi), landing within 150 m (490 ft) of a designated point." You posed a question about Archer, Lewkowicz and the Blériots XI. Please find here some background information. Both men were asked to fly at the meeting (of the E.N.V.) at the Molenhei (1910, August 28 - September 4). At this meeting, Archer flew the Blériot XI of the E.N.V. The Blériot XI was the famous monoplane in which Blériot crossed the Channel. Blériot sold a lot of planes of this famous type, including one for the E.N.V. and one for Lewkowicz. Albert Edwin Reed (1846–1920) was the founder of Reed Elsevier, formerly Reed International, one the United Kingdom's largest professional publishing businesses. Career: Entering the paper industry as a boy, Albert Reed first managed or part-owned paper businesses before he acquired a fire-damaged building, Upper Tovil Mill, near Maidstone in Kent in 1894. Albert Reed specialised in the production of paper suitable for halftoneblocks for which there was considerable demand at the time and by 1903 he owned seven mills. Under his leadership the business expanded rapidly securing an order to supply newsprint for the Daily Mirror in 1904. Reed was importing paper from a mill in Canada by 1911. He died in 1920, leaving the management of the business to his twin sons. Reed was a staunch Methodist and a philanthropist.